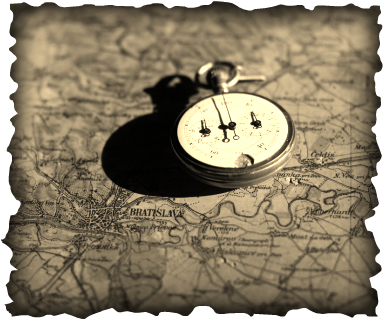 We enjoy looking for "off the beaten path" history. Hold on to your seats folks, it will be a fun ride! Where in the world are the Flanagan's? 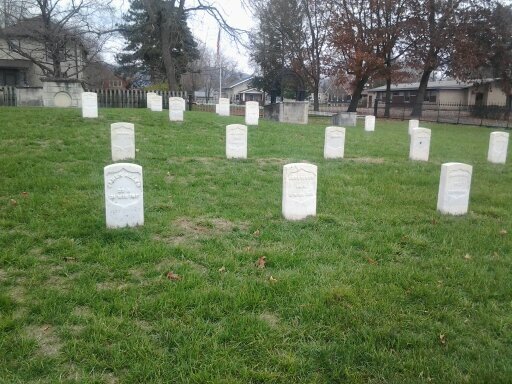 A few weeks back the Flanagan's happened upon an old US Military Cemetery. 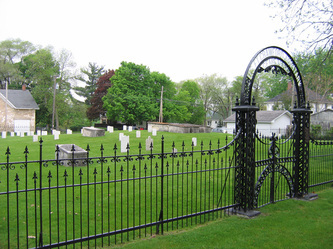 This small cemetery is located at 413 South Beaumont Road. We found out some interesting little historical facts about his location. 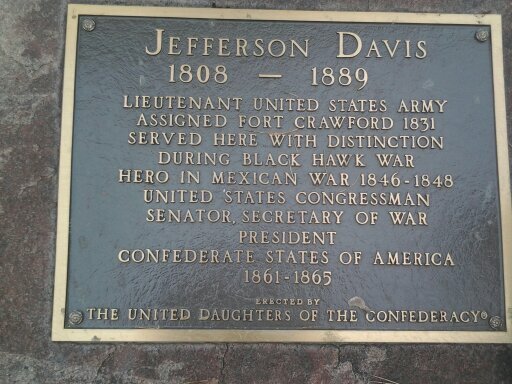 We had NO idea that our very own Jefferson Davis had served a stint at this particular fort! We also learned that Zachary Taylor found himself "serving some time" at the 'ole fort working out some deals with Black Hawk. One sad comment about this particular little place is very few grave markers had names; most were listed as unknown. 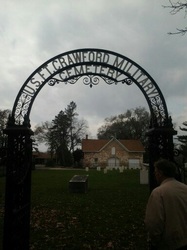 "Fort Crawford Cemetery is located on the former site of the Fort Crawford Military Reservation. There were two subsequent Fort Crawfords during the 1800's. The original fort, built in 1816, was situated adjacent to the Mississippi River. Repeated flooding led to its abandonment in 1826. Rebuilt on higher ground in 1830, the second Forth Crawford operated until 1856. In the spring and summer of 1832, Black Hawk, leader of a band of Sauk and Fox Indians, clashed with U.S. forces in northern Illinois and southern Wisconsin, in a conflict now known as the Black Hawk War. After the Battle of Bad Axe in 1832, Black Hawk surrendered to the forces of Colonel Zachary Taylor and was imprisoned at Fort Crawford. 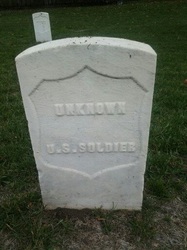 The soldiers' lot is located in block 13 of the Fort Crawford Cemetery. The first burials here were of the members of the 1st and 5th Infantry regiments stationed at the fort. The soldiers' lot includes eight above-ground box-tombs that were likely erected by the regiments. The United States received the title for the lot in 1866. 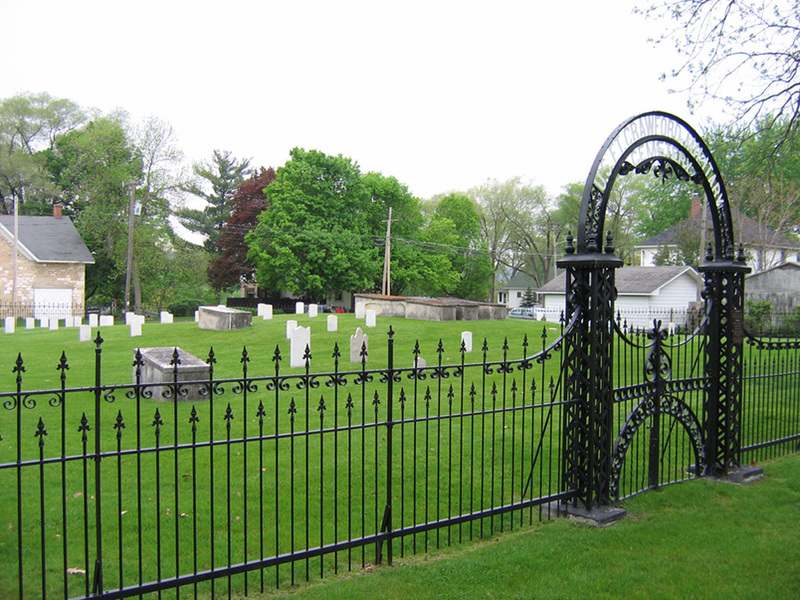 There are approximately 64 interments in the 0.59-acre soldiers' lot, including the remains of four soldiers removed from the Protestant cemetery at Prairie du Chien. 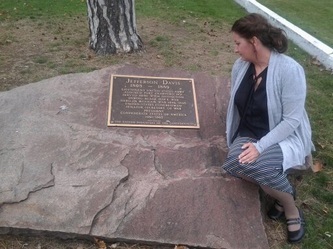 The United Daughters of the Confederacy erected the Jefferson Davis Monument in the 1930's near the entrance of the soldiers' lot. Lt. Jefferson Davis served briefly at Fort Crawford as a young man; later he became the president of the Confederate States of America. Fort Crawford is one of at least four sites that claim to be the setting of Davis' elopement with the daughter of Zachary Taylor. 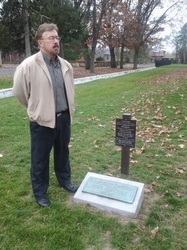 The monument, estimated to date to the 1930's, consists of a large boulder with a bronze plaque." 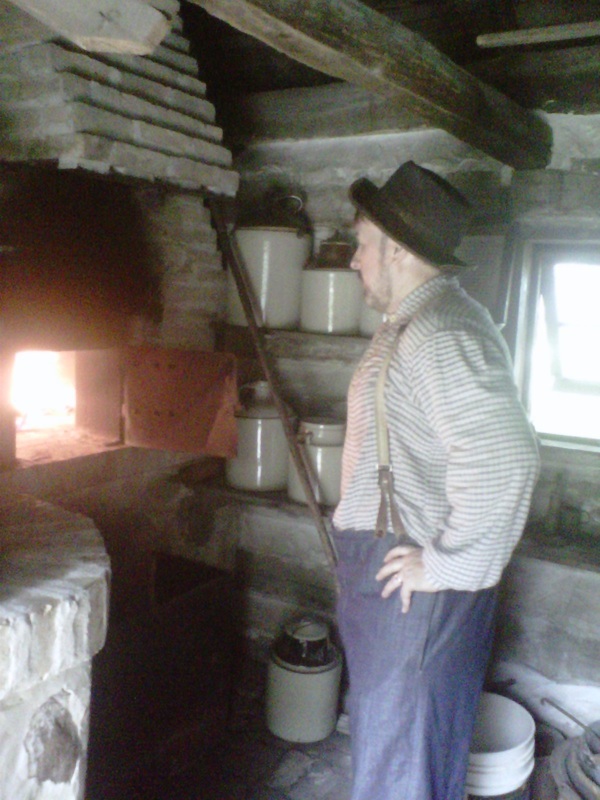 Mr. Flanagan and I were able to portray an Amish couple for the day! 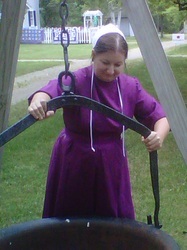 It was great fun learning about the Amish and the Mennonite. Just for a day we dressed as they dress...worked as they work...and lived as they live! We even took a trip to the local WalMart for some fun. It was amazing the amount of people that stopped to look at us and whisper. It was almost sad how some folks of the younger generation giggled as they watched us; it was like we made them uncomfortable. How odd that we can put on clothes from the 1860's and be "cool" but folks from the Amish or Mennonite culture are "funny"? Either way...we learned quite a bit about their culture and we must say we thoroughly enjoy living among their families here in the Drift-less Region of Wisconsin! 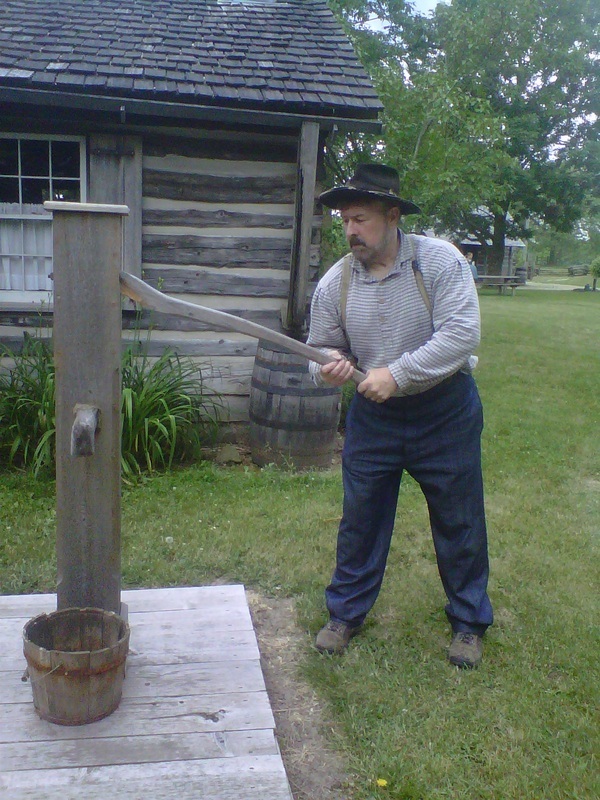 The Flanagan's had a fantastic time at the Galloway House and Historic Village. It was great to see re-enactor friends and portray history for the weekend. Mr. and Mrs. Flanagan were able to take residence for the weekend in the log cabin located in the village. 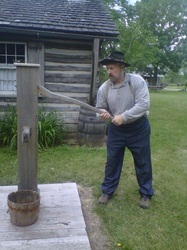 Mr. Flanagan spend the better part of the weekend convalescing, and Mrs. Flanagan worked hard spinning wool on her spinning wheel. 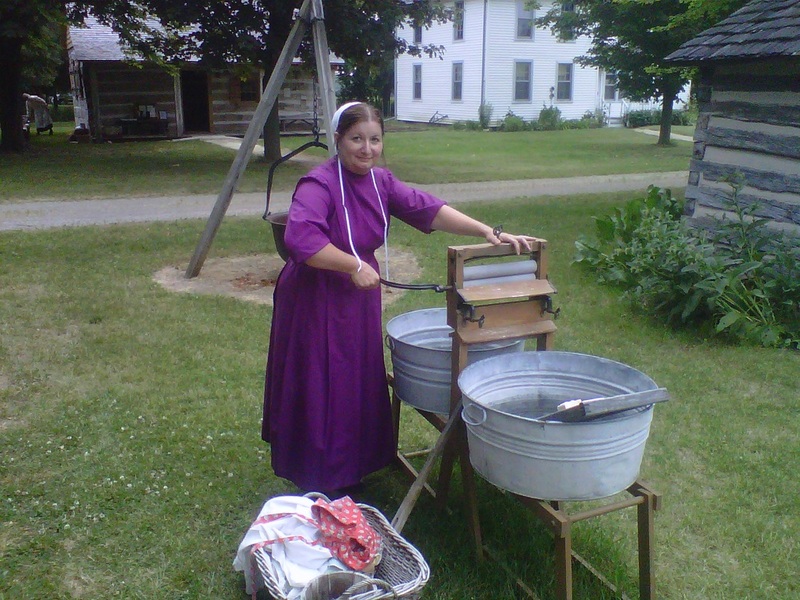 She explained how the spring shearing was now complete; she had sold some of her wool, and the rest of it she was spinning for knitting mittens, scarves, and hats for the upcoming winter season. She also explained how the blockades prevented her from securing fabrics, so she had to drag out her grandmother's spinning wheel and learn how to use it again. Mr. Flanagan was honored to be called to the ministry in the line of the traveling preacher. He delivered a fine sermon on how to make sure we are not "blind-sided" , and how keeping up on daily readings from Scripture can prevent it. 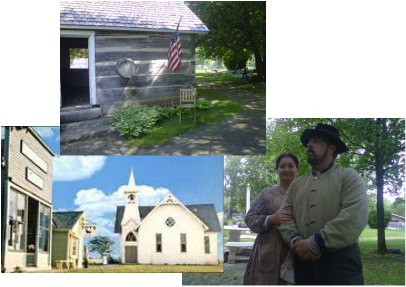 Thank you to the Historical Society for putting on this small, but great little event! Deep in the heart of the Kickapoo Valley among the beautiful rolling hills, rural bike and horse riding trails, and speckled with Old Order Amish is a quaint and charming country Inn known as Amil's Inn. The Flanagan's were given a gift of a one night stay, and they will be back! If you are looking for country charm sided with a nostalgic quiet peace we recommend a stay here! Dave and Anita Reeck are charming and delightful to be with, and time passes quickly with enlightening conversation about history and the good 'ole days. One can almost feel as if they are transported to a simpler time as they travel the rural roads in this area. Amish men atop large wooden and iron plows are planting the fields with draft horses of six to eight in a team; women with prayer caps in place are seen tending to their gardens, or hanging their monotone clothes on the line. 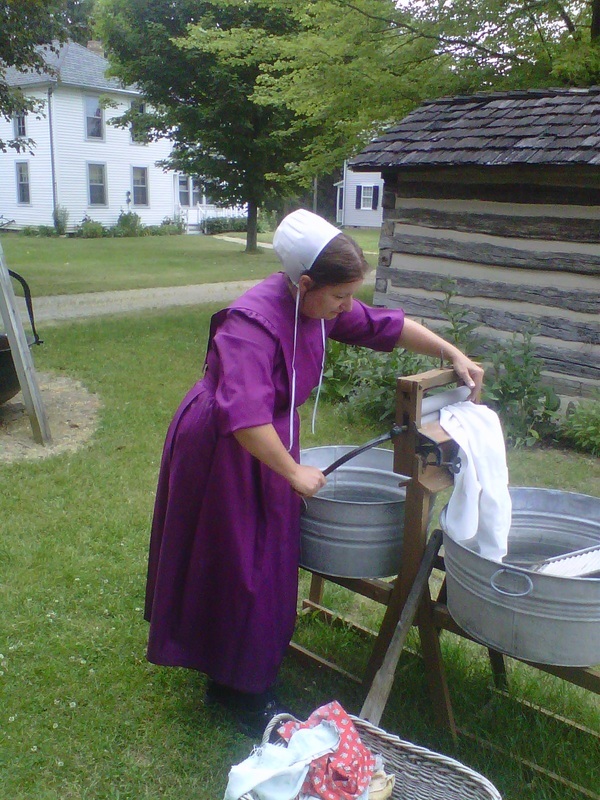 It is easy to forget the present troubles and relax with a warm Amish quilt at this Bed and Breakfast. Thank you Dave and Anita for your fantastic hospitality! We decided to take a drive out to the Lower Kettle Moraine area to see what we could see. We were excited to find many EARLY signs of spring! Flanagan was quite impressed with a small conservancy we found known as Lulu Lake. It must have been the name of the lake that impressed him?? I even found a critter I wanted to make into a hat, but Flanagan would not get it down for me! On Valentine's Day...we decided to go for a hike in the local nature center here in Southwest Milwaukee County. We enjoy getting away from the traffic and noise; escaping to Whitnall Park gives us that sense that for a moment we are no longer in the middle of a bustling, pollution filled city! Deep in the woods in the area known as Spruce...the Flanagan's learn the art of log hauling! If you are looking for a peaceful farmhouse setting to relax in, we recommend this Bed and Breakfast. The Innkeepers, Michael and Kerri are wonderfully friendly and so accommodating. Mr. and Mrs. Flanagan enjoyed delightful conversation over wine and cheese, and were thoroughly enthralled by the Victorian setting around us. Built in the 1880's this house features images and artifacts from prior owners. The fireplaces are beautiful and compliment the 11 foot ceilings featuring many of the original light fixtures. Located in Waupaca on the beautiful Crystal River...this place was a great place to start our traveling adventures!